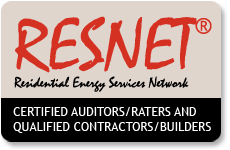 As part of an effort to increase consistency with HERS ratings, RESNET updates it’s standards to include: ANSI/RESNET/ICC 380-2016 Standard for Testing Airtightness of Building Enclosures, Airtightness of Heating and Cooling Air Distribution Systems, and Airflow of Mechanical Ventilation Systems. Yeah, and you think you have a branding problem. There is a lot here that will impact how HERS ratings are completed for homes permited after July 1, 2018. I don’t feel great about these changes. By adding more terminology and more detailed testing procedures, I expect that ratings will become less consistent not more consistent. IMO, a better solution would be to require raters to explain their rationale for determinations around testing volumes and inside/outside components, such as infiltration volume/ conditioned floor area. Or even better, like PHIUS, standardize the use of Sketchup for more streamlined oversight and communication. Standard 380 replaces Chapter 8 and it is here- there is no use grumbling about it. For code compliance single-point blower door tests, results must be multiplied by 110% before calculating ACH50 result (whole house air change per hour). For multi-point blower door testing (software assisted blower door testing at pressure reading between 10 and 60 pascals) this 10% ‘adder’ is not required. Single point blower door testing procedures are slightly simplified. SO WHAT? - For most builders in 2012-2018 IECC jurisdictions, 3 ACH50 is not difficult anymore. If you consistently build around 2.5 ACH50 or lower, I would not be concerned. For homes that are very close to the 3 ACH50 code required tightness level, paying for the more complex ‘multi-point’ blower door test procedure may be worth it. Or, consult with your rater where additional airsealing opportunities can be had. A whole house air leakage result of 2.7 or 3 ACH50 is not hard. It doesn’t require spray foam or European tapes with funky names. Just have a plan and make sure Jo Sub is on board. First a review of 2012/2015/2018 IECC code requirements for context: If the home has any portion of the forced air heating/cooling duct system outside of insulated space, the entire duct system(s) needs to be tested to a level of <4 CFM 25 per 100 sq. ft of conditioned floor area. This is no joke. The result of this strict target is that ducts are tighter and more commonly located ‘inside’ of the insulated volume of the home. This is a good thing. The Standard 380 changes how we perform duct leakage testing, and is now slightly more complicated and time consuming. Duct tightness testing MUST be completed at the air handler, not a central return register. Exception: 3 or less returns in entire house AND <50 CFM of total system leakage (very tight ducts) OR if there are access/safety issues that compromise the rater’s ability to test at the cabinet. Also, the ENTIRE SYSTEM must be installed for the test. No longer is a mid-point, duct only/no handler test allowed to demonstrate code compliance. Of course testing at this phase in construction is good idea to verify tightness, while ducts are still accessible. Some practical changes have been made concerning where to tape off duct registers. It is now okay to tape inside boot if floors have carpets or grills are not installed. SO WHAT? - Requiring testing at the cabinets will likely add cost to duct testing. Hopefully the benefits and gains in consistency, outweigh this. It is unclear to me how ducted heat pumps will be tested as a central return is often the only access point to the heat pump cassette. This is another reason to avoid duct testing by moving all ducts inside of insulated space or going ductless. Conditioned floor area and home volumes have a large impact on HERS rating and airtightness testing results. Without getting too deep, for insulated spaces to be considered part of the ‘conditioned space volume’, the heating/cooling equipment needs to be sized so temperature set points (68 heating, 78 cooling) can be met, verified by a Manual J sizing report. This shouldn’t be a problem as long as there are access doors/hatches to insulated attics and insulated semi-finished basement with supply registers. Modern heating/cooling equipment can modulate effectively, rarely are they undersized for this to be a problem. Simple volumes and thermal boundary transitions , less funky roof lines and quasi insulated knee wall spaces etc, will still result in a more efficient ouse that its easier to pass energy codes. It is unclear to me how HERS rating software will change to incorporate the increased specificity of building volumes and to ensure greater consistency among ratings. The increase of HERS Ratings in Massachusetts in 2015, with an average index of 56, demonstrates that achieving that level of performance is not exceedingly taxing to the industry. The market can bear this level of efficiency and energy codes don't pain builders much.